Funny thing is, as I read his card, I was reminded instead of my own mother. 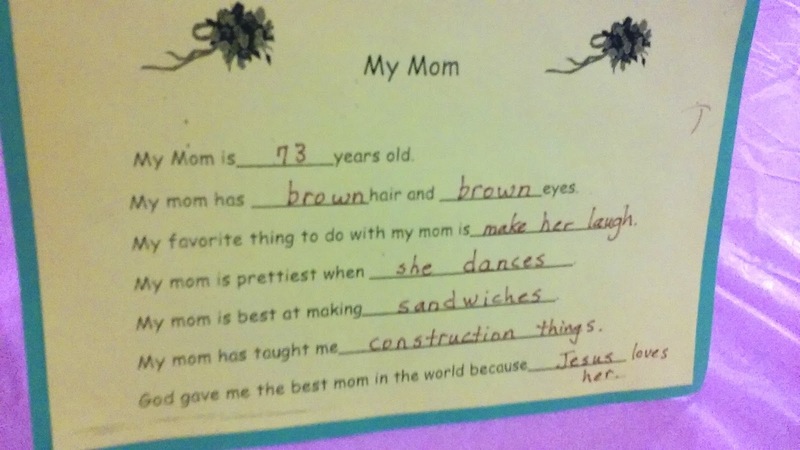 I still remember the Mother’s Day event when I was in first grade and she joined me for our own version of Muffins with Mom. But more than that, I smiled because some of the things Joel said about me are reflections of some of the very same things that can be said about her (with the exception of the age of course). On one hand I was surprised Joel attributed me to teaching him construction things. On the other hand I’m not. It was my mother who taught me to use a nail, hammer, and screwdriver. It was she who taught me to assemble a bookshelf and reads instructions so I could make anything together that I needed to. My mother taught me how to change a flat tire and had me do it myself when I was 17, because it’s a skill that every person needs to know. 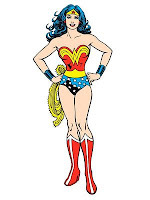 You see, you probably don’t know this, but I was reared by a real life Wonder Woman. 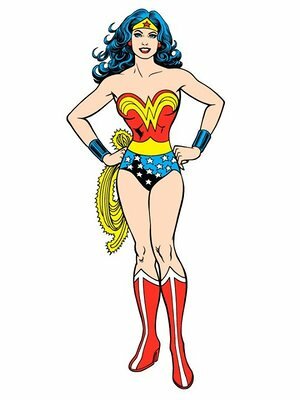 When I think about Wonder Woman, the first picture that flashes in my mind is Lynda Carter in her costume when I used to watch her on TV. The next picture that flashes in my mind is my mother. She didn’t wear a costume, but she was just as strong and just as courageous as the fierce woman I watched on TV. It was at my mother’s hand that I learned to cook and clean and even sew. She taught me to do my own laundry at 12 years old. Then she taught me to wash my clothes by hand, because “you’ll never know when you need to do it”. About 10 years later, I was with a group of friends in Eastern Europe with no washing machine around. Guess who was able to hand wash her own clothes and teach her friends the same skill? My mother taught me social manners and acceptable behavior becoming a young lady. She taught me modesty and that my self-worth didn’t come from the clothes I wore or the shape of my body, but from my heart, my brains, and my faith. She taught me how to choose a boyfriend. “Any man who tries to control you while you are dating is bad news,” she said. She taught me it was never acceptable to let a man hit me. She taught me that worthiness didn’t come from being in a relationship, but from who God made me to be. She taught me that marriage doesn’t dissolve problems and issues, it magnifies them. So she made sure to share with me the value of choosing well, so that the battles we faced would not be insurmountable. She taught me the value of self-respect and that it was worth holding on to. She taught me to be respectful to my elders and those in authority but never to compromise my values in return. She taught me how to give to others when I have more than enough to share as well as when I had nothing at all. Giving was more about love and service than money was. Giving was a generosity that came from the heart to support your fellow man, especially one who needed help. Joel said I was prettiest when I danced. Yet I don’t hold a candle to my mother when she dances. She comes alive when she dances and all you can do is watch the beauty of it or join in on the fun. Most often she compels you to join in on the fun. My mother taught me the serenity that comes from song and music. Some of my favorite songs are ones she used to sing around the house when she cleaned. I can close my eyes and hear her singing them right now. My mother taught me how to be a woman of faith and steadfast perseverance. 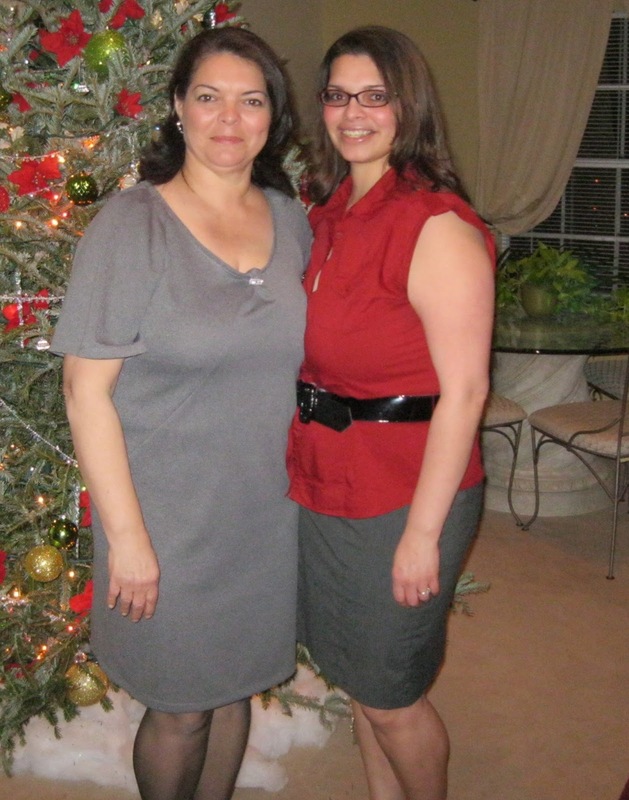 If I am any sort of strong woman at all, it is because I am my mother’s daughter and she taught me well. And if all that wasn’t enough, this woman I called Mom, completed this task all by herself. My parents divorced when I was young, and my mother found herself with 4 children under the age of 10 to rear on her own. I am the mother of 2 young boys, separated by almost 2 years, and find that raising them in complete partnership with my husband is one of the hardest and most exhausting things I have ever done. My mother had 4 children within 5 years and had the task of raising us alone. Exhausted wouldn’t even begin to cover it for me if roles were reversed. You see, I was raised by a real life Wonder Woman. I am blessed that she is a wonderful grandmother to my kids and I get to talk to her every day. She’s just as amazing now as she was all those years. Except now I get to value all those wonderful things I took for granted then.